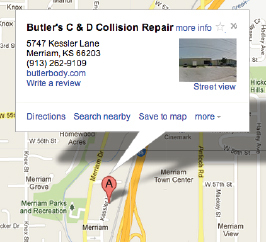 The staff at Butler Collision & Damage is comprised of exceptionally well-qualified and personable people. Come see for yourself! Body Technician Carlos Vargas | Hobbies: Watching Mixed Martial Arts (MMA) Fights. Polisher AJ Deleon | Hobbies: Coaching his sons soccer and T-ball team. Painter Steve Butler | Hobbies: Spending time at the Lake of the Ozarks. Assistant Manger Travis Davidson | Hobbies: Playing Soccer and other sports and watching KU Basketball and Sporting KC Soccer. Office Manager Denise Vertz | Hobbies: Making quilts and spending time at the Lake of the Ozarks. Owner Ron Butler | Hobbies: Cycling and other outdoor activities. Please call OUR MERRIAM FACILITY at 913.262.9109, or CLICK HERE to fill out the form on our home page.